June 16, 2014 5:30 P.M.
--A. Approval of June # 1 Payroll in the amount of $51,410.74. --B. Approval of Claims in the amount of $58,887.60. --C. Approval of Minutes from May 29, 2014 Special Meeting, May 29, 2014 Work Session and June 2, 2014 Regular Meeting. --D. Approval of Budget Amendment # 26 in the amount of $84.52 for EMS run overpayment. --E. Approval of Budget Amendment # 27 in the amount of $619.99 for Surplus Auction Sales. --F. Approval of Budget Amendment # 28 in the amount of $300 for refund of opening/closing of cemetery lot. --G. Approval of Budget Amendment # 29 in the amount of $865 for donations from Cherokee Nation 5k runs. --H. Approval of Budget Amendment # 30 in the amount of $25.00 for refund on Park Shelter rental. 7. Discussion, consideration and possible action to appoint Dawn Eyler as Park Board member with term expiring May 3, 2018. -- Another candidate will be needed as Ms. Eyler declined the appointment. (If you are interested in serving on the park board, contact Mayor Bud York). * Utility income down (except sanitation) ... weather related this past year ... which has been typical with most communities in the state. * budget is conservative on estimates sales tax revenue in coming year (based on last 3 years results). And only budget 90% of that estimated. * Some street paving budgeted ($55K) .. assumes Tulsa County assist ... paving by Post Office will be done with grant dollars. * Pam & Bud York attended a luncheon about 2 weeks ago with the new Miss America. An INCOG sponsored event with her platform focused on childhood obesity. --A. Approval of June # 1 Payroll in the amount of $30,582.35. --B. Approval of Claims in the amount of $346,088.29. --D. Approval of Budget Amendment # 31 in the amount of $196 for May 2014 State Collected Building Code fees. * Great crowd at Hogs 'N' Hot Rods. 283 entrants (up from 250 last year). City provided polycarts, water, electricity, barricades, etc. Many event photos on City's Facebook. 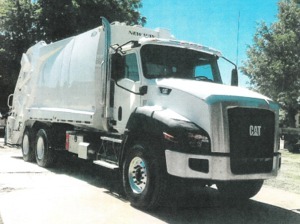 * New city sanitation truck (see photo above) arrived Friday June 13th and ran first route June 16th. Continued thanks to the outstanding job our trash haulers do in all kinds of conditions. Pam Polk mentioned a recent incident where the trash employees came to the rescue of a resident who had fallen and needed assistance. Phil Stowell provided this photo of the new city trash truck that went into servive Monday June 16, 2014. The city logos will be added soon. TIME: SHUTTLE BUS WILL START @ 6:00PM FROM THE COLLINSVILLE HIGH SCHOOL. 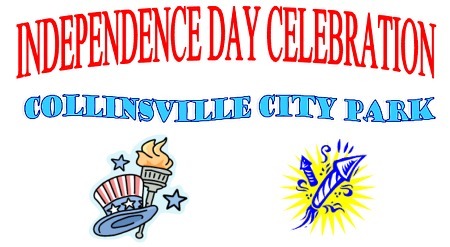 DROP OFF AT COLLINSVILLE PARK FOR CELEBRATION AND THEN RETURN TO THE HIGH SCHOOL AFTER. LIVE BAND! FREE WATERMELON! CONCESSION STAND! FIREWORKS AFTER DARK SO BRING LAWN CHAIRS & BLANKETS AND GET READY FOR A SHOW!!!! !